Production of ammonium nitrate. Industrial receiving nitric - acid. Ammonia as key product of the different nitrogen-containing substances applied in the industry and agriculture. Process of its synthesis. Physical and chemical properties of ammonium nitrate. 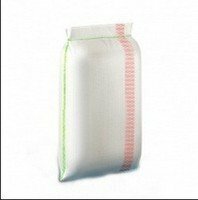 Ammonium nitrate - represents crystal powder or granules of white color with yellowish shade, salt of nitric acid. It is well dissolved in water, ammonia, pyridine, methanol, ethanol. In usual atmospheric conditions decays extremely slowly. Density is 1,725 g/cm ³-. Melting temperature - 169,6 ° - C, boiling temperature - 235 ° - C, decomposition temperature - 210 ° - C.
Ammonium nitrate - strong oxidizer, in a dry form explodes from detonators. To mechanical influences (blow, friction) it is not sensitive. At impact of fire and spark on ammonium nitrate of fire does not occur. At the fires it decays, emitting oxygen that strengthens burning of flammable objects. At the strong fires of the warehouses containing large amount of saltpeter explosions owing to its rough thermal decomposition and intensive gas generation are possible. This well soluble highly effective mineral ammonium and nitrate high-concentrated - fertilizer. Contains 34,4% of nitrogen. 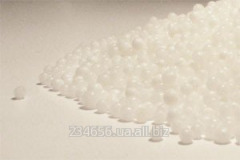 For agriculture ammonium nitrate is issued in the form of granules of spherical shape. Among all fertilizers it wins first place on use in agriculture which makes 55-60% of the market of fertilizers. Possesses high hygroscopicity that did not dampen add the additives absorbing moisture: ground limestone, chalk, phosphorite meal, phosphite. It is applied to mineral nutrition of cultures at the main, preseeding introduction and to top-dressing of crops. The greatest efficiency is reached when using ammonium nitrate for early-spring top-dressing of winter wheat, colsa and also for introduction superficially or locally to crops or at crops of summer cultures, top-dressings of industrial, vegetable and melon crops. The high effect is gained at joint introduction with phosphorus and potassium. It is forbidden to bring ammonium nitrate under cucumbers, vegetable marrows, bush pumpkins and pumpkin as promotes accumulation of nitrates! This fertilizer is made as follows: nitrogen is connected with hydrogen, as a result of the happening reaction ammonia is formed - ammonia is oxidized afterwards to nitric acid and if to connect ammonia to nitric acid, then ammonium nitrate i.e. ammonium nitrate will turn out. Such agrochemistry will contain nitrogen in two forms, that is ammonium and nitrate (17% of ammonium and 17% of nitrate nitrogen, in the sum of 34% of nitrogen). Popularity of ammonium nitrate is explained by its universality as this fertilizer is everywhere used in agriculture for any cultures and on all views of soils. 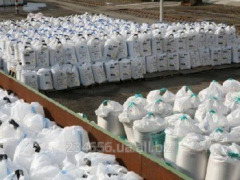 Unbelievable price on N-34,4 ammonium nitrate in Kharkov (Ukraine) company Harkovtorgservis, OOO.